Sometimes I’m too tired to cook. But I do it anyway. On the rare occasion when I succumb to lethargy, I feel it’s a defeat. Why should living alone entail a less full life? Why shouldn’t I expect of myself a dinner at table? A life eating on the couch watching TV is a half-life and like all carbon-based things I feel my life seeping out of me when I do it. Reading and listening to music at the table is an ongoing commitment to making my single life as rich as I can. When I feel too tired to prepare a meal, I lower my expectations, but I don’t abandon them. Half the effort an ordinary weekday meal requires comes in figuring out what I want to eat. So, here is a simple idea. I am enjoying adding diced potatoes the dishes I have always thought would be weighed down by additional starch. A little potato adds umami, another dimension to a dish. This one is a no-brainer. Dice half a chorizo link and four fingerling potatoes. Scrape the kernels off one ear of corn. Pour 2 teaspoons of olive oil or lard in a small skillet over a medium-low flame. Add a minced garlic clove or two and a minced shallot. Let them soften in the fat. Then add the chorizo. Spread the chorizo out so that the pieces are not crowded. Leave them be for two or three minutes. Stir and let them be for another couple of minutes. Add the potatoes, stir, and let them brown with the chorizo. 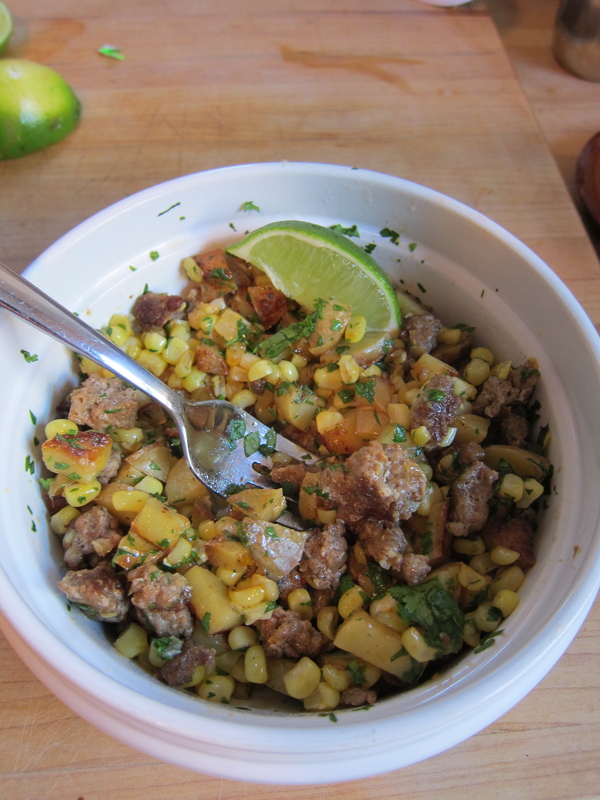 Add the corn, mix it all together. Season with salt and pepper. Put in a bowl and have with a small salad.